The textile industry in India traditionally, after agriculture, is the only industry that has generated huge employment for both skilled and unskilled labor in textiles. The textile industry continues to be the second-largest employment generating sector in India. It offers direct employment to over 35 million in the country. The above processes were mostly exempted under the pre-GST regime. This had an adverse impact on textile industry since it obstructed the flow of credit in the value chain. The manner of taxation of textile industry in pre-GST regime is briefly highlighted below which would better assist in understanding the GST impact on this industry. Branded Readymade garments falling under Chapter 61, 62 and 63 having a Retail Sales Price (RSP) of Rs. 1,000 and above attracted Central Excise Duty of 2% (without CENVAT) or 12.5% (with CENVAT credit). Such excise duty was attracted on 60% of RSP after allowing deduction of 40%. Optional Central Excise exemption – In case of garments and articles other than those mentioned above, an option was provided to the person to pay Central Excise Duty at Nil rate without availing CENVAT credit. If the person exercised this option, he could clear the specified goods without payment of Central Excise duty, however, CENVAT credit was not allowed to him in this case. If the manufacturer did not wish to avail optional exemption. Central Excise duty was payable and CENVAT benefit was available to him. Garments/articles of cotton, not containing any other textile material attracted duty of 6% (with CENVAT credit) and other garments/articles attracted duty of 12.5% (with CENVAT credit). However, majority of the persons opted for the optional exemption scheme since it is beneficial from cash flow perspective and reduces compliance burden on the manufacturer. To manufacture apparels, textile industry availed various input services. However, they could not avail the benefit of service tax paid on input services as the textile sector mainly operated under optional duty exemption as explained in above paragraphs. This therefore added to the cost of manufacturing the products. 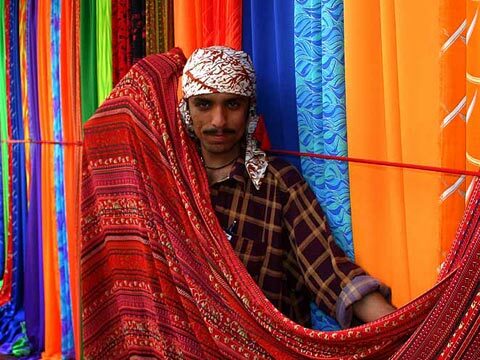 The levy of VAT and CST on sale of textile goods varied from state to state in India. Most of the States in India levy VAT at a lower rate on garments, usually in range of 5%-6%. Under VAT, many States also provide an option to tax payers to opt for composition scheme in which tax was payable at concessional rate. Entry tax was levied on entry of goods into a local area for consumption, use or sale therein. In many States, entry tax was levied on specified goods when goods entered local area. Even textiles such as cotton, woolen or silk or artificial silks were liable to entry tax in some States like Karnataka at the rate of 1% which added to the purchase cost. In the pre-GST era, textile industry mainly operated under duty exemption mode. As explained above, benefit of CENVAT credit was not available to manufacturer availing duty exemption which got baked in the cost of the product. Further, many persons operated at a small scale and were either unregistered persons or took registration under composition scheme which again disrupted the flow of credit and lead to cascading effect. Under GST, Government has withdrawn the optional exemption route and imposed GST on textile industry (supply of fabric attracts GST@5%, cotton fibre and yarn attracts GST@5%, Synthetic yarn and Man-made fibre attracts GST@18%). An attempt has been made to organize a fairly unorganized sector. If the players in the textile industry get themselves registered, it would enable flow of credit to the end consumer and lead to reduction in prices of the manufactured product. With the introduction of GST, various indirect taxes which were earlier levied (such as Central Excise, Value Added Tax/ Central Sales Tax, Octroi, Entry tax) have been subsumed. This has led to substantial reduction in compliances to be undertaken by the manufacturer. Under GST, such person is required to deal and comply with only GST law. It should also be noted that merging of various taxes under GST would also lead to reduction in cost of production of textile products. Under textile industry, processing of goods through job work is a normal phenomenon i.e. movement of goods happens to job-worker and goods move back to the sender post completion of process by the job-worker on the goods. Under GST, any treatment or process which is applied to another person’s goods is treated as supply of service. Job-worker receiving the goods for undertaking job-work is required to register under GST and discharge tax liability (provided the turnover of job-worker exceeds the threshold limit). Considering the labour intensive focus of job-work for textile products, the GST rate on job work on textile-related items has been reduced from 18% to 5%. This would ensure that job-worker is not severely impacted due to introduction of GST. Reverse charge mechanism in respect of procurement of goods or services by registered person from unregistered suppliers has been suspended till 31 March 2018. This would imply that registered person obtaining services of weaving, spinning etc. from unregistered persons will not be required to deposit the GST under reverse charge mechanism. However, this benefit is temporary till 31 March 2018 post which the reverse charge mechanism will be activated on such transactions. The textile industry involves interdependence between organized and the unorganized sectors which will pose additional challenges to the industry. Considering the mechanics of textile industry, many persons who cross the threshold limit may prefer to opt for composition scheme since compliance burden on a person opting composition scheme is relatively less than on a normal tax payer. There will also be small weavers and other players who will not cross the threshold limit and will remain as unregistered persons under GST regime. Under GST, synthetic yarn and man-made fibre is taxable @ 18% whereas the output fabric is taxable at a lower rate of 5%. This would lead to issue of inverted duty structure and accumulation of credit. You may be aware there is a provision of claiming refund of unutilized input tax credit in case of inverted duty structure. However, in case of specified woven fabrics and knitted fabrics, the refund of unutilized input tax credit has been disallowed. This would result in accumulation of huge input tax credit and working capital blockages. The introduction of GST has resulted in removal of concessions/exemptions for the textile industry which saw outrages and protests by various associations and players in the textile industry. Considering the intent of GST and peculiar manner of operation of textile industry, it may take slightly longer for textile industry to off-set the initial hiccups of GST and grow at a competitive pace.